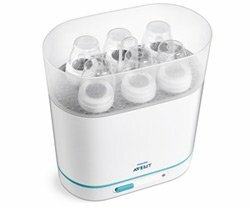 The Philips AVENT 3-in-1 electric steam sterilizer, with its adjustable size, takes up the least amount of kitchen space yet perfectly fits the items you want to sterilize whether it's a few small items or a full load. The 5 minute cycle with automatic shut-off uses natural steam sterilization to kill 99.9% of harmful germs. 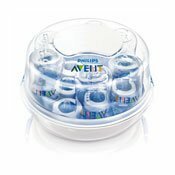 Philips AVENT 3-in-1 Electric Steam Sterilizer effectively eliminates 99.9 percent of bacteria from your baby's feeding items in just minutes. It holds up to six bottles, yet it takes only minimal space in your kitchen. Advanced features, such as a six-minute cycle with automatic shutoff, make it easy to sterilize breast pumps, bottles, cups, and more. Sterilizes six bottles at a time in as little as six minutes. View larger. 3-in-1 system offers multiple sterilization options while taking up minimal space. View larger. AVENT Electric Steam Sterilizer kills 99.9 percent of germs through intense steam sterilization. Used by hospitals, steam sterilization is an effective way to protect your baby from harmful bacteria. Simply plug the unit into any standard electrical outlet to safely and effectively eliminate most household germs in as little as six minutes. Due to its adjustable size, the AVENT 3-in-1 Electric Steam Sterilizer fits the items you want to sterilize and takes up minimal kitchen space. 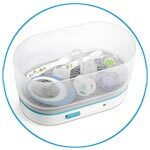 Three-in-one functionality gives you the option of a small configuration for sterilizing pacifiers, a medium configuration for breast pumps, toddler plates, and utensils, and a large configuration for six 11-ounce bottles. It can even hold wide or narrow-necked bottles. Operating at a higher temperature than a dishwasher, the AVENT 3-in-1 Electric Steam Sterilizer uses electricity to generate intense steam. Just add water to the base, load the rack, and turn on the power. The unit will operate a six-minute cycle and automatically shut off when complete. The contents will remain sterile for up to 24 hours if the lid remains unopened. 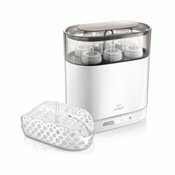 The Philips AVENT 3-in-1 Electric Steam Sterilizer is backed by a full two-year warranty. 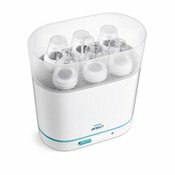 Philips AVENT 3-in-1 Electric Steam Sterilizer, tongs, and instructions. This sterilizer's lightweight, compact design makes it ideal for use in and out of the home. Contents remain sterile for up to 24 hours if lid is unopened. This electric steam sterilizer has been designed to make sterilizing as simple as possible. With adjustable size, it takes up less kitchen space and the baskets fit both wide and narrow neck bottles. 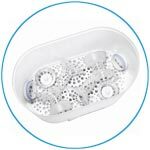 The 4-in-1 sterilizer has the same benefits as the 3-in-1 with great extras like the dishwasher basket, the process indicator for hassle free precleaning, and an advanced display to keep you informed.